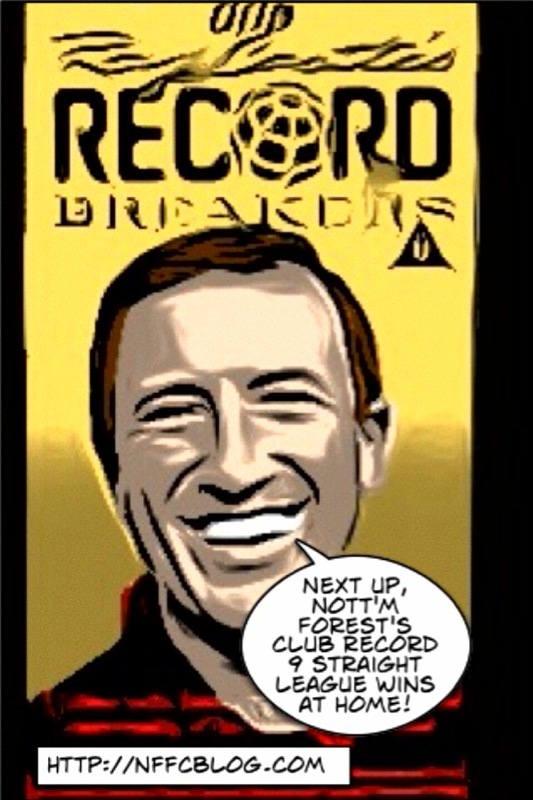 Record breakers! | Through the seasons before us..
You Reds! Congratulations Billy Davies! Don’t stop believin’…. We are going up, say we are going up!! Have we really beaten the record? The BBC report we have equalled our 1906/07 and 1953/54 achievement. Couple of things from yesterday’s game – Anderson looked like he was back to his former self – head down instead of head up, an awful lot of effort with little end product. Just as he was starting to look a real threat too. And McKenna was bloody terrible for 80 minutes but during those last 10 he was immense. Great backing from the crowd for the 2nd half and you could see it visibily lifted the players. Well, even if we’ve matched something last achieved more than 50 years ago, I think it’s worthy of note! I thought Raddy would need to get to 10 bookings to get a ban now it’s post-Jan? Great result and for me the raising of the volume by the crowd certainly coincided with Forest raising their work rate in the 2nd half. Good to see. Ironically 3 lungs Cohen looked a bit out of sorts for me yesterday but up he pops for the goal – every cloud etc…. I’m with you Egor – McKenna is a little bit of an enigma, because he has the vision to pick out a good pass, but lacks the execution and can therefore look like the opposition’s best player. But yesterday I thought he was magnificent, especially in the second half, the engine room of the team and kept everyone’s pecker up even when it looked like we might not get the goal. Bristol City 2 WBA 1 final score. YES!!!!!!!!!!!!!!!!!!!!!!! That is a fantastic result for us (never mind Bristol C.) Again we find ourselves in a position where we’re looking to Derby to do us some favours when they play WBA next week. However, we have to make sure we keep our end up and Leics away is going to be very hard. They will be as up for it as Derby were so we need to be tougher than ever. Hopefully we’ll of learnt something from that game and apply it to this one. Then its Swansea who are again in the playoffs. Come through those two with 4 pts and I’ll be very happy. A week off is probably just what we need as Leicester play midweek, so let’s hope Donny run them around a little! One of Billy´s twists and turns this afternoon. I watched the baggies match until they scored and I switched off..
Then later saw the result,with 4 bookings !! .Well done city !!!! Still 2nd !!!!! Generally good blog on what is the first and only site that I visit for reports of the game but can’t agree with your overall assessment of the ref as I thought he had a largely good game – He tried to let it flow and it was nice to see that every bit of physicality didn’t result in a free kick. I accept the bloke wasn’t flawless – Aliadiere should definitely have been booked for his, to be generous, tackle on McKenna. He was good in the first half, second half he seemed very inconsistent. Definitely a massive improvement on some of the clowns we’ve had lately though. Agree on Perch, he had another good game – but with the caveat he’s horribly out of position. I thought the ref could have been a lot worse, at least compared to Sheffield Wednesday and Sheffield United (you know he is bad when both sets of fans think he is terrible!). Raddy’s booking was well-deserved, in fact seeing it on TV he could have had a red 😦 But Aliadiere definitely deserved a card – good to see the lino helping out as usual. Oh yeah, and Kelv was definitely offside. What a brilliant achievement by this young forest team.9 wins on the bounce and we are still very much in the mix for automatic promo. 13 games left even if we only win 6 or so were gonna be in with a great shout.Nothing but praise for what wee billy and his team have done to the reds. Its gonna be an exciting run in. Sure, he was all other him but both had their arms raised as they tussled for the ball. There was no other undue contact tho. As for the actual strike, watching Chrissys’s eyes I thought he had looked to the keepers right before placing it to his left. Actually he didn’t – he just concentrated on getting it on target. Maybe thats why the celebration was so muted! Real surprise it went in. For winger READ whinger – doh!! I think cohens celebration or lack of it was a dressing room thing.Remember he lost the plot last time he scored at west brom i think this was tongue in cheek plus maybe a bit of surprise at the execution. But credit to him a vital goal for us . Loved Cohen’s reaction against West Brom. A player who got his big chance with Forest and he has come on leaps and bounds and you can see he loves the club for it. His workrate and engine magnifies whatever talent he has and I think he’ll continue to improve. The celebrations by both Raddy and Chrissy against WBA were magic – both players just looked so delighted to have got such important (and decent) goals. Come on Rish, they weren’t just ‘decent’, especially Raddy’s. If that had been Rooney we’d still be hearing it talked about now by every rent-a-gob pundit going. In fact its a good topic this one cos I rate Raddy’s goal vs West Brom so high I’m struggling to think of a Forest player in the last 10 years that has scored one that was so technically difficult and jaw droppingly good as that. It’s the sort of goal you see at world cups by gifted players you’ve never heard of. You see so many players attempt that and they never go in. If it was just a tap in it would of been a fantastic team goal but it was not just a great move but one of the best Forest goals we’ve seen in years. Am I going over the top here? Of course I don’t disagree with you. They were both crackers, and as I have posted elsewhere, I don’t think I will ever get fed up of THAT goal by Raddy, or his celebrations! West Brom have signed Ben Watson! Shows the high caliber available still through the loan market, and another case of the board’s dalliances leaving us behind our rivals. Having a think about the Prem squads, maybe Richard Hughes from Pompy or Danny Pugh from Stoke? Neither are getting ANY games, and both are good at this level. Liam Lawrence? He’s deffo a Davies player, and a local lad. Maybe even one of the Everton kids. Its all about cash Dr Horse forest seem to have a wage cap and be very reluctant to pay over the odds in wages .Plus watson i dont think wants to come to us and never has. Its a tricky situation loan deals not all fans understand all the politics and red tape behind loan deals.But i agree that we need a couple of decent bodies in who will fight the cause and compliment the side.Billys no calderwood he knows how to balance a side and bring in the right bodies. Yea I’m with you Red Ric, but you know some clubs will waive a full wage contribution if they value the match practise, or someone like Pompy where even a few thousand and the odd bonus off the wage bill will make a difference. Removing a disgruntled attitude from the dressing room can also be worth more than money alone. All I meant was that there are plenty of forgotten men and underused youngsters out there who would add to our squad, meaning we could still get a coup from the loan market. Also surely Doughty will be spending in summer even if we don’t go up, so what’s a few hundred thousand between friends to improve our chances massively this time? Not wanting to hijack this thread but I’m going to anyway. (Sorry) On the previous subject of great goals where do all you lot stand if you could pick out your favorite Forest goal? Which one would it be? What did it do for the club? I’m pretty sure if you were an Arsenal fan then Michael Thomas’s against Liverpool would be right up there. Have we got any goals like that? I’d say John Robertson’s against Hamburg, Pearce against Peterboro to clinch promotion coming back from 2-0 down, Metgod’s freekick against West Ham although I don’t think this actually had a massive impact on our season. Pearce’s banana free kick against Coventry in the league cup Semi (89) he just stood there with his hand in the air. Brilliant! I’m going to have to stop… I’m getting all misty eyed. I’m too young for any of those but the Bart-Man against Reading in ’98, Marlon King against West Ham in ’04 and then McGugan’s freekick against Yeovil were probably the most emotional ones for me, and all important in their own way. Ian Bowyer vs Cologne 1979 – has to be the most significant goal as everyone thought we were dead & buried after the 3-3 draw at CG…. 4, and last but not least Gary Charles’s og whilst he was at Derby !! I cant wait until we square up too the winging scouse neds again. Definitely the Robertson goal vs Hamburg. Ian Storey-Moore scoring against Arsenal on Boxing Day in about 1970 (maybe 1971) – a bit like Maradona’s 2nd goal in the “Hand-of-God” game! It earn’t a 1-1 draw so not really significant in club terms, but it was probably the goal that made me a Forest fan – so I think it was pretty important. and Kevin Campbell’s goal against Middlesborough in the 4-0 win. Most significant Forest goal of all-time has to be Francis scoring against Malmo. Liking all the goals mentioned, in recent times though, how about Julian Bennett against Yeovil on promotion day? Crunching tackle to win the ball, and a deft curling finish with the outside of the boot. Yep – that was a good one to (particularly the tackle) – I’ll ask him about it tomorrow!